Nivola was born in Boston, Massachusetts. His mother, Virginia (née Davis), is an artist, and his father, Pietro Salvatore Nivola (born 1944), was a professor of political science. Nivola's paternal grandfather was the Italian sculptor Costantino Nivola, and his paternal grandmother, Ruth Guggenheim, was a Jewish refugee from Germany. Nivola has described his mother as "a WASP, from the South", and has stated that she is a relative of Confederate President Jefferson Davis. He has a brother, Adrian, and attended Phillips Exeter Academy and Yale University. Alessandro's family also lived in Burlington, Vermont, where he attended Mater Christi School, a ministry of the Sisters of Mercy. Nivola earned a Drama Desk Award nomination for his first performance on the New York stage in the 1995 Broadway production of A Month In The Country opposite Helen Mirren. Since then he has starred in numerous films including David O. Russell's American Hustle which earned him a Screen Actors Guild Award. Among his other films are Lisa Cholodenko's Laurel Canyon (Independent Spirit Award nomination for best supporting actor), Coco Before Chanel, Junebug, Mansfield Park, Kenneth Branagh's Love's Labour's Lost, Jurassic Park 3, Goal 1 and 2, The Eye, I Want You, Best Laid Plans, Janie Jones, Five Dollars A Day, and John Woo's Face/Off (Blockbuster Entertainment Award nomination). In 2009 he was given the Excellence in Acting Award at the Provincetown International Film Festival. In 2013, Nivola was among The New York Times critics' pics for an Oscar nomination for his performance opposite Elle Fanning and Annette Bening in Sally Potter's film Ginger & Rosa. In 2014, he appeared in the films The Devil's Knot and A Most Violent Year. He returned to the theater and starred in the 2010 Off-Broadway revival of Sam Shepard's A Lie Of The Mind directed by Ethan Hawke. In 2013 he starred as Sir Robert Morton in the Broadway revival of Terrence Rattigan's The Winslow Boy. He returned to Broadway in the fall of 2014 starring opposite Bradley Cooper in a revival of The Elephant Man. In 2012, Nivola established the film and television production company King Bee Productions with his wife, actress Emily Mortimer. Their first project was a six-part television series called Doll & Em which Nivola produced and Mortimer wrote and starred in. The program aired on Sky Living in the UK and on HBO in the United States in 2014. Nivola married British actress Emily Mortimer in Buckinghamshire in January 2003. The couple have two children and live in the Boerum Hill, Brooklyn, New York City. 2001 Jurassic Park III Billy Brennan Did not return to voice his character in Lego Jurassic World. 1996 Remember WENN Paul Rice Episode: "Valentino Speaks!" ^ "Alessandro Nivola Biography (1972?-)". Filmreference.com. Retrieved May 26, 2014. 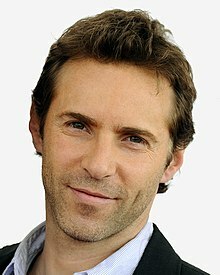 ^ "Alessandro Nivola Biography". Tvguide.com. Retrieved May 26, 2014. ^ Fee, Gayle (October 1, 2007). "Inside Track". Boston Herald. ^ "Thomas J. Davis, 77, Investment Executive". The New York Times. September 13, 1990. ^ Elias, Justine (September 13, 1998). "THE NEW SEASON/FILM: UP AND COMING: Alessandro Nivola; From a Family of Painters, a Quick-Change Artist". The New York Times. Retrieved May 28, 2018. ^ "Costantino Nivola: public and private: a selection of Nivola's sculptures, soon to leave the U.S. for a permanent home in a museum devoted to the artist in Sardinia, provided a rare overview of his work at the Parrish Museum". Art in America. Retrieved May 26, 2014. ^ Tangcay, Jazz (April 25, 2018). "Interview: Alessandro Nivola on Playing the Conflicted Dovid in Disobedience". Awards Daily. Archived from the original on May 20, 2018. Retrieved May 19, 2018. Alessandro Nivola: "My grandmother was German-Jewish from Frankfurt and she ended up being a Holocaust refugee." ^ Pisani, Lavinia (November 10, 2015). "A Conversation with Italian American Star Alessandro Nivola". L'Italo-Americano Newspaper. Retrieved May 19, 2018. ^ Bloom, Nate (April 18, 2018). "Amy Schumer 'feeling pretty'; and a young Jewish Picasso". J. The Jewish News of Northern California. Retrieved May 19, 2018. ^ Menzel, Scott (May 9, 2018). "Alessandro Nivola talks Disobedience, reuniting with Rachel Weisz, and The Art of Self-Defense". We Live Entertainment. Retrieved May 28, 2018. ^ Scaduto, Anthony (September 9, 1999). "Quotes: ALESSANDRO NIVOLA isn't afraid of stardom". Newsday. ^ Huck, Peter (July 14, 2001). "Charmer chameleon". The Daily Telegraph. London. ^ "And the Nominees Should Be". The New York Times. December 27, 2012. ^ Vincentelli, Elizabeth (November 16, 2013). "Alessandro Nivola: My Brooklyn". New York Post. Retrieved February 21, 2019. ^ "Alessandro Nivola: My Brooklyn". New York Post. Retrieved February 12, 2017. ^ Potter, Sally. "Ginger & Rosa". Sally Potter. Archived from the original on January 16, 2013. Retrieved September 17, 2012.